The Guardian has a regular “In Praise Of…” column on its leader page where rather than just moaning about things, it’ll sometimes, well, praise something. It’s quite a refreshing change to read something positive in that part of the paper. Last night, I saw the column above published online, and while I was going to mention it being a little odd, I just put it down to the fact that The Guardian has quite a sizeable US operation, and that’s what I must be reading. So when I saw the column in print in the very much British print edition of the paper (see photo above), I was perplexed. 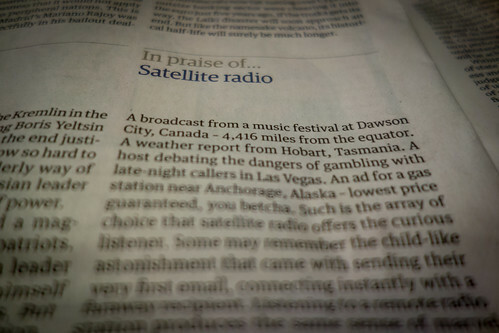 In praise of… satellite radio starts by referencing a music festival in Dawson City, Canada, and a weather report from Hobart, Tasmania. The online piece links directly to relevant websites. At first I thought that whoever wrote this really did mean “satellite” radio. In the UK, we have a very limited view of satellite radio. 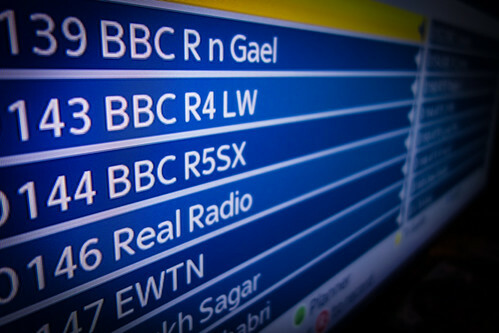 It’s mostly national BBC and commercial stations with a few local services and a number of niche stations aimed at minorities of one type or another. In the US, subscription satellite radio is quite a decent success – in terms of subscriber numbers anyway. SiriusXM has a broad range of services, many of them exclusive to the satellite service, all available for a fee. Small Canadian and Australian stations are notable by their absence though. So what on earth is this piece talking about? Do they mean “internet” radio? I think they might. I suspect that even if you’ve never listened to the radio via the internet, you probably have a vague notion that it comes down the same wire that your internet connection does. As opposed to coming from a large metal object orbiting at 22,000 miles above the surface of the earth. The piece ends, “Sure, Radio 4 in the background provides a homely sustenance; but there’s an entire world out there to listen to.” And I wouldn’t disagree for a moment. But that’s not satellite radio.